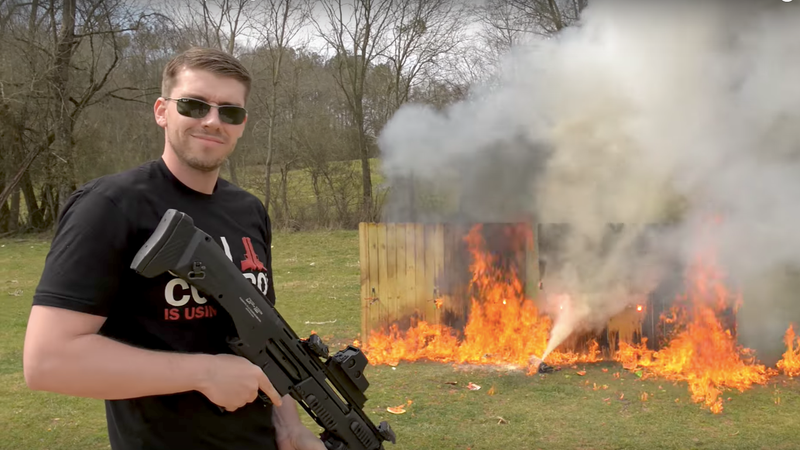 Federal authorities recently searched the property of Kyle Lamar Myers, the guy who’s famous for pretending to be Russian then shooting huge guns and causing violent explosions on the popular YouTube channel FPSRussia. Before the search, the sheriff of Franklin County, Georgia arrested Myers for receiving drugs in the mail. And the story only gets crazier from there. It seems like the drug-related arrest is part of some sort of sting operation. Feds have searched Myers’s properties looking for illegal weapons once before. If this isn’t a sting operation, the Bureau of Alcohol, Tobacco, and Firearms stumbled across a huge stash of weapons seemingly by accident. But it really doesn’t seem like an accident. The ATF only obtained a search warrant for the Myers property in Carnesville, Georgia, after the local sheriff caught the 31-year-old gun enthusiast receiving, one local source reports, butane honey oil (a marijuana concentrate) through the United States Postal Service. The warrant enabled the ATF to carry out the search, during which agents confiscated over 50 firearms, drug paraphernalia, and more drugs, possibly butane honey oil. No illegal explosives were found on the property. All this trouble has left Myers facing a felony charge for possession of a Schedule 1 substance with intent to distribute as well as a misdemeanor charge for possession of drug-related objects. Here’s the kicker: ATF spokesperson Nero Priester says the agency seized the weapons “in conjunction with a federal statue that prohibits any illegal drug user from having firearms.” The feds will hold on to those weapons as they await the results of a blood test to determine whether or not Myers was an active drug user. So you could say that Myers, whose Dmitri Potapoff character has helped the FPSRussia YouTube channel win 6.3 million subscribers, is having a bad month. He’s actually having a bad decade. In January 2013, Myers’s business partner Keith Ratliff was found shot in the head at the offices of FFL Industries Global LLC, his gun shop. Police believe Ratliff was murdered, perhaps by someone he knew. The killer was never found. Two months after Ratliff’s murder, ATF agents along with local and state police raided Myers’s home as well as his family’s 60-acre farm. This was after Myers had gained a huge following on YouTube for doing things like blowing up trees with incendiary rounds, shooting his fans with rubber bullets, and driving around town in a tank armed with a .50-caliber machine gun. Authorities say they were looking for illegal explosives during the 2013 raid but did not find any. It looks like Myers is really in trouble this time around, though. He’s out of jail on a $10,000 bond and faces state charges. It’s unclear if the ATF will seek federal charges through the nearest US Attorney’s Office, but it wouldn’t be a surprise. It seems like being in close proximity to a bunch of drugs, guns, and explosives—not to mention an unsolved murder—is a bad idea.